Fiberuary Day 18 with Margaret Russell Writer, Weaver researcher of Rare British Sheep Breeds and so much more. While growing up I listened to accounts of maternal ancestral weavers and wool workers from Ireland and England. Fascinating conversations with my mother and aunt certainly influenced me to follow the ways of my fiber forebears. One such ancestor, my 3X great grandfather William Truland (Trulan), was born in Ballymoney, County Antrim, Northern Ireland. Early in the 19th century he left and settled in my native upstate New York, continuing his skill as a professional weaver. Antrim Handweaving, Studio & Study is named in tribute to him. I take great pride in my connections with those who came before me and I believe my weaving inherently upholds tradition. All my pieces are woven exclusively of natural fibers, with a focus on the timeless beauty of simple functional design. An area of particular interest of mine is primitive, rare, and threatened British sheep breeds. In the 1970’s, there was growing recognition in the UK and the USA that large numbers of livestock breeds were in serious decline, and in fact several breeds had already become extinct. At least 20 known British sheep breeds were permanently lost before the 20th century and then a half dozen more disappeared between 1900 and 1973. With the founding of the Rare Breeds Survival Trust (RBST) UK in 1973 and the American Livestock Breeds Conservancy in 1977, now known as The Livestock Conservancy, plus the dedication of loyal flock keepers, sheep farmers, and consumers of wool and meat products, further extinction has been prevented. In fact, many British sheep breeds have experienced an increase in their population numbers but vigilant monitoring continues as there are breeds still struggling with low population numbers. I really wanted to work on something where I could pay tribute to an ancestral weaver from County Antrim, Ireland, raise awareness of the fragility of watchlisted British sheep, and support safeguarding of the breeds by using and encouraging others to use their wools, so I started a long-term endeavor of weaving an extensive private collection of “Preservation Wraps”. My objective is for each of the watchlisted British breeds to be individually represented by a wrap woven exclusively of its naturally colored wool. I use the Rare Breeds Survival Trust, UK and The Livestock Conservancy, USA watchlists to identify the breeds whose wools dress my looms. The wraps representing the breeds from the RBST’s watchlist are woven using wools sourced from the UK. Wraps representing the British breeds raised in the USA and identified on the The Livestock Conservancy’s Conservation Priority Listing are woven using wools sourced in the USA. Most of the wools are purchased directly from the farmers themselves! The wraps in the collection are specifically woven to highlight the fleece characteristics of each breed. They are all woven in plain weave, the simplest of weave structures therefore the wool is always the feature, not various patterns. If I am able to find it, I add handspun to provide even more texture. The size of each wrap depends on wool availability and dimensions range from 30”x40” to 40”x60”. I like to think each wrap looks as if it were lifted right from the sheep itself. When complete, there will be over 70 wraps in the collection. More than half of the wraps are woven. Almost all the wools have been acquired and are waiting for their turn on a loom. 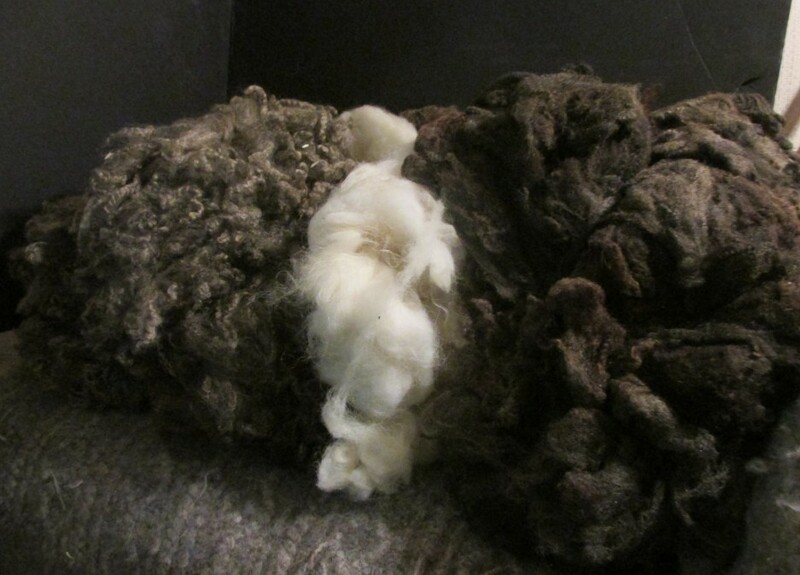 When I first started weaving with British breed wool, I realized I wanted to know more about the breeds themselves. Who are the creatures that produce these intriguing and remarkable fibers? I soon learned about loss and survival, hardship and triumph, heartache and happiness. I discovered sheep with two and even three pairs of horns, some with long tails, and others with lustrous ringlets of fleece that trail along the ground. There’s a breed that has a natural smile, another with a diet of seaweed and the feet of dead seabirds, one with fleece so soft it was historically used for knitted undergarments, and that was only the beginning. I am totally smitten by all of them. “Sheep That Roar”, “The Death and Life of the Norfolk Horn”, “Identically Different”, and “A Sheep in Sheep’s Clothing” are but a few of my heartfelt tales about these extraordinary animals. Come join me at Sheep & Shawl on February 21, 1-3pm, in celebration of FIBERuary! A selection of Preservation Wraps and their stories, fleece and yarn samples, photos, books, and yarn sources will be shared during my British breed presentation known as “Weaving Legends”.